HCM includes a group of inherited conditions that produce hypertrophy of the myocardium in the absence of an alternate cause (e.g. aortic stenosis or hypertension). It is the most common cause of sudden cardiac death in young people and affects 1 in 500 of the population. The majority of cases are familial autosomal dominant, due to mutations in the genes encoding sarcomeric proteins (Fig. 14). 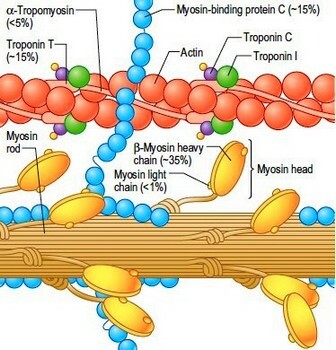 The most common causes of HCM are mutations of the β-myosin heavy chain and myosin-binding protein C. Other mutations include troponin T and I, regulatory and essential myosin light chains, titin, α tropomyosin, α actin, α myosin heavy chain and muscle LIM protein (although over 400 mutations have been identified.) There are non-sarcomeric protein mutations in genes that control cardiac metabolism that result in glycogen storage diseases (Danon’s, Pompe’s and Fabry’s disease) that are indistinguishable from HCM. Fig. 14 Sarcomeric proteins implicated in hypertrophic cardiomyopathy. ■ fourth heart sound (if not in AF). Fig. 14.1 Hypertrophic and dilated cardiomyopathy. 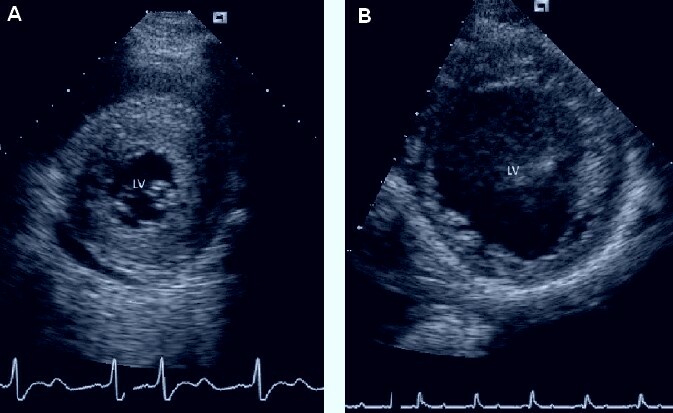 a Transverse echocardiogram of the left ventricle (LV) at the start of systole in hypertrophic cardiomyopathy shows a greatly thickened wall with a small end-diastolic diameter of the left ventricle (concentric hypertrophy). b In dilated cardiomyopathy, the ventricle is dilated and the ventricular wall is thinned. a LV angiography demonstrates apical hypertrophy, which has caused typical apical obliteration of the left ventricle, producing a “spade-shaped” ventricle. b Echocardiography shows massive thickening of the interventricular septum (IVS) and massive apical hypertrophy. RV = right ventricle, LV = left ventricle, RA = right atrium, LA = left atrium. ■ dyspnoea occurs due to impaired relaxation of the heart muscle or the left ventricular outflow tract obstruction that occurs in some patients. The systolic cavity remains small until the late stages of disease when progressive dilatation may occur. If a patient develops atrial fibrillation there is often a rapid deterioration in clinical status due to the loss of atrial contraction and the tachycardia - resulting in elevated left atrial pressure and acute pulmonary oedema. • Two-dimensional echocardiography is used to establish the diagnosis. Findings include: ventricular hypertrophy, ratio of septum thickness to left ventricular wall thickness >1.3:1, increased ejection fraction. • Magnetic resonance imaging may be of diagnostic value when echocardiographic studies are technically inadequate. MRI is also useful in identifying segmental LVH undetectable by echocardiography. Advise avoidance of alcohol; alcohol use (even in small amounts) results in increased obstruction of the left ventricular outflow tract. • Propranolol 160 to 240 mg/day. The beneficial effects of ß-blockers on symptoms (principally dyspnea and chest pain) and exercise tolerance appear to be largely a result of a decrease in the heart rate with consequent prolongation of diastole and increased passive ventricular filling. By reducing the inotropic response, ß-blockers may also lessen myocardial oxygen demand and decrease the outflow gradient during exercise, when sympathetic tone is increased. • Verapamil also decreases left ventricular outflow obstruction by improving filling and probably reducing myocardial ischemia. • IV saline infusion in addition to propranolol or verapamil is indicated in patients with CHF. • Disopyramide is a useful antiarrhythmic. • Use antibiotic prophylaxis for surgical procedures. • Avoid use of digitalis, diuretics, nitrates, and vasodilators. • Encouraging results have been reported on the use of DDD pacing for hemodynamic and symptomatic benefit in patients with drugresistant hypertrophic obstructive cardiomyopathy. • Implantable defibrillators are a safe and effective therapy in HCM patients prone to ventricular arrhythmias. Their use is strongly warranted for patients with prior cardiac arrest or sustained spontaneous ventricular tachycardia. • Surgical treatment (myotomymyectomy) is reserved for patients who have both a large outflow gradient (=50 mm Hg) and severe symptoms of heart failure that are unresponsive to medical therapy. The risk of sudden death from arrhythmias is not altered by surgery. • Nonsurgical reduction of interventricular septum represents a new, controversial, and unproven therapeutic approach that can be used in patients with HCM that has proved refractory to pharmacologic treatment. 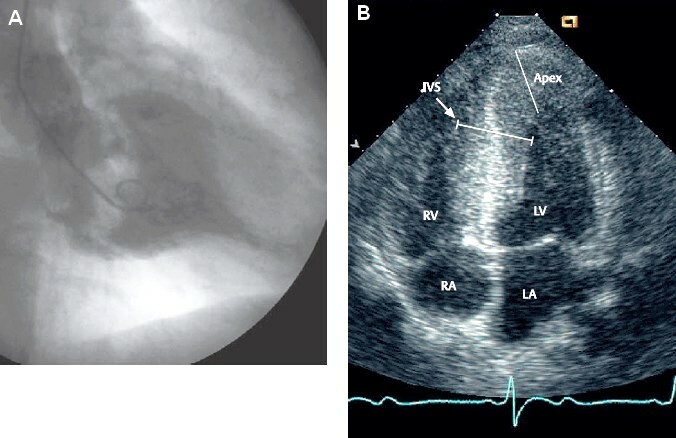 This technique involves the injection of ethanol in the septal perforator branch of the left anterior descending coronary artery, producing a controlled myocardial infarction of the interventricular septum and thereby reducing the left ventricular outflow tract gradient. This method can lead to sustained improvement in both subjective and objective measures of exercise capacity but is associated with a high incidence of heart block, often requiring permanent pacing in about one fourth of patients.